I've shared photos of the Batman TV series action figures revealed by Mattel for the 2013 Toy Fair. However, do you want to know a secret? Do you promise not to tell? Oh, oh closer. At one time I had a Barbie Travel Camper, but I put super hero stickers on it I swear. I converted into a Justice League version of the Mego Mobile Bat Lab. Nevertheless, I have never in my life owned a Barbie doll, but that might just change this year. 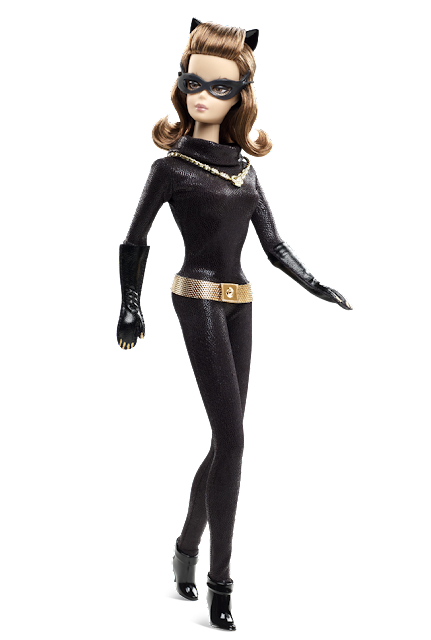 Now, I know I am going to get razzed to death by Eric of Toyriffic for saying this, but not only am I going to buy the 6 inch Batman series action figures and Batmobile, I am going to get these Barbie Batman dolls pictured above. Pretty much any toys that are going to be released in relation to the TV series I am going to be picking up. I am not sure of the release date of these yet, but the Batcave Toy Room will keep you posted as soon as we know more. Stay tuned for more pics of the 6 inch Batman TV series figures. Still waiting for pics of Robin (Burt Ward), Catwoman (Julie Newmar), Joker (Cesar Romero), and possibly Batgirl (Yvonne Craig). Note: The figures pictured here may be customs. Update: It is appearing that these are legit. 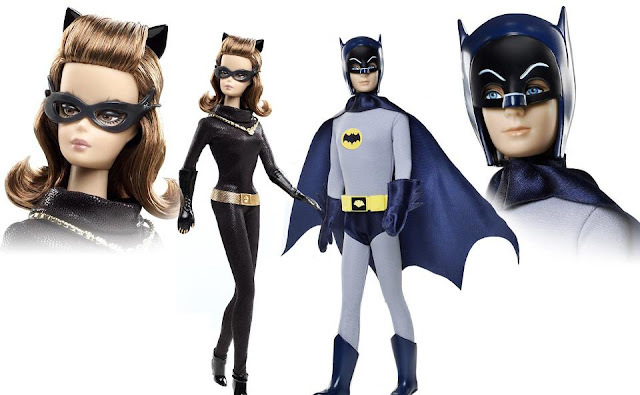 It looks like Mattel has chosen to use the vintage look of both Ken and Barbie, which I think is actually pretty cool as it gives the feeling as though the dolls were made during the original run of the Batman TV series from 1966-1968. Below is a closer look at both dolls, including one of Batman without the cowl. Boy is is Batman looking thin. The MSRP is going to be $34.95 each. Release date is June 2013. Anyone else man enough to pick these up? These are cool John and it looks like you are going to have to make some more room in your collection for these. I am already thinking about where I am goind to put it all JBoy. I like to think of them as action figures. That helps when I put them beside my Barbie Batgirl, Supergirl, Superman, and Wonderwoman. I genenrally do too Cal. I always wanted to pick those others up, but never did. I definitely will not be passing on these new ones. 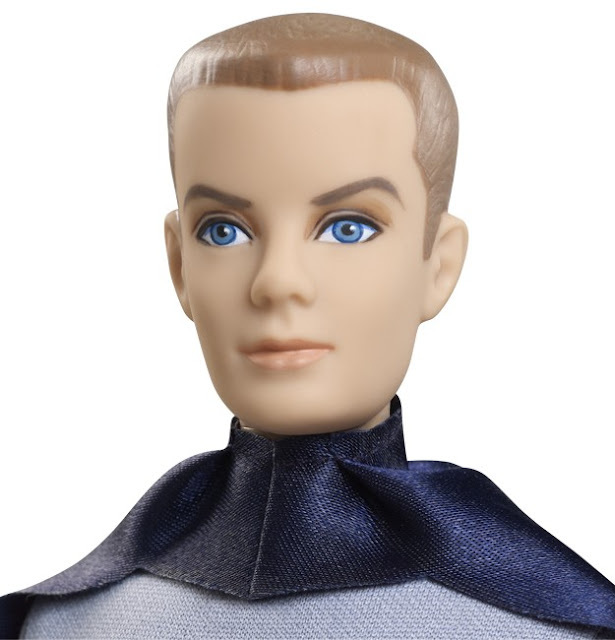 There are a lot more cooler Batman TV series action figures coming as well, but for me I am pretty much going to pick up everything related to the show that comes out. 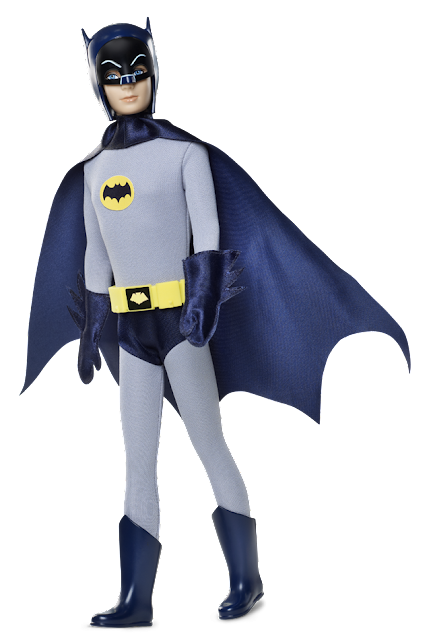 Batman looks waaaaaay too effeminate.